Defending champion Chris Froome moved up to second overall in the Tour de Romandie in Switzerland after finishing second on stage three. The Briton was beaten in a sprint finish by Katusha's Simon Spilak, who assumed the race lead by one second. World champion Rui Costa was 57 seconds adrift in third on the 180km stage from Le Bouveret to Aigle. 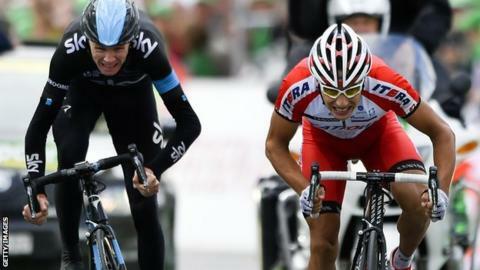 Team Sky rider Froome, the 2013 Tour de France winner, began the day in ninth place. There are two days remaining in the race, including Sunday's concluding time-trial. 3. Rui Costa (Portugal/Lampre) +57"
4. Jakob Fuglsang (Denmark/Astana) +57"
5. Benat Intxausti (Spain/Movistar) +57"
2. Chris Froome (Great Britain/Team Sky) +1"
3. Rui Costa (Portugal/Lampre) +1:02"
4. Vincenzo Nibali (Italy/Astana) +1:06"
5. Mathias Frank (Switzerland/IAM Cycling) +1:10"